I wasn’t aware that I was going to see Molly Tuttle. It had been a busy day. I had attended a couple of networking events; one at Aintree racecourse and another at the Anglican Cathedral. It was late evening and I was on my way to the Grateful Fred’s Session at the Atkinson Theatre in Southport to see an artist. Exactly who I was going to see, was still unknown to me. However, I was assured that I was already a fan. It was a surprise from my girlfriend. I hadn’t seen any promo because I hadn’t spent much time online. My mind began to sift through my cerebral database to identify who could be playing. My first line of enquiry was “Who’s still alive?”, next “Which one of my favourite musicians would be playing of venue of this size?” My mind kept drawing a blank. Anyway, I had to wait a little longer before I found out. Nevertheless, the wait was made a little easier while I listened to the last couple of tracks by the duo on stage. They are called Limerence and comprise of Calum Gilligan and Jenny Coyle. Their voices blend together exceptionally well, their material is strong. Together, they emanated a warm, gentle stage presence, free of any pretence. By the time Calum and Jenny left the stage I’d almost forgotten the reason I was there. Then after a short interlude two female figures took to the stage; one clutching a banjo and the other an acoustic guitar. Molly Tuttle! and…? We’ll I’d discovered Molly by accident while looking at flat picking clips on Youtube. One particular clip, which blew me away, was a version of Townes Van Zandt’s White Freight Liner blues. I used to cover that song. I’m a big fan of Doc Watson and Clarence White to name but two, but to see someone so young playing that way was amazing. Up until this point, I wasn’t aware of who Rachel Baiman was but as soon as she sung her first note I was a fan. Her knack for combining catchy melodies with clever turns of phrase was immediately obvious; not to mention her fiddle and banjo playing, which were equally awe-inspiring. 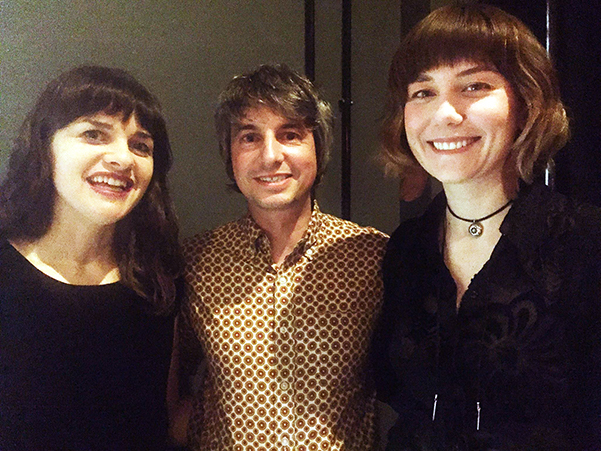 The set began with a song, which Molly co-wrote with American Singer Songwriter Korby Lenker, called Friend and a Friend. This showcased how Molly and Racheal’s voices knitted together beautifully as did the instrumentation. Rachel switched from the fiddle to the banjo for a song called Shame with its lazy, infectious groove, which makes your head bob like a Churchill dog on a Sunday drive. The set was punctuated with a few short anecdotes; one about how Rachel had just bought a shack in Nashville with her Fiancé; a couple of doors down from John Hartford’s old house. Two of John’s tracks were given the Tuttle/Baiman treatment; Maddison Tennessee and Gentle on My Mind. Other highlights from the set were Something to lose, Never Tire of the Road (Andy Irvine) from Rachel’s album, Shame and Save this Heart from Molly’s album Rise. It was a pleasure to see such pure musicianship. Molly Tuttle’s picking is so clean and precise; she can make the strings pop and ring without so much as a glance at the fretboard. Rachel’s Baiman’s fiddle playing cuts straight to the heart of a song adding an almost ethereal dimension to the music. The musical chemistry between these two artists is really something. After the show we spoke to Molly and Rachel; bought a couple of CDs, which they kindly signed. They were quiet, humble and were open to small talk. They had been enjoying tea parties on their tour so far. I asked them about the microphone they used for the show. It captured the subtleties of the different instruments as well as their voices, culminating in one of the best live audio mixes I’ve possibly ever heard. As it turns out its called an Ear Trumpet Microphone. They retail at around $600. It’s been over a year since the release of my third solo album, Mark III. My next full studio album is already in the process of being written and recorded. 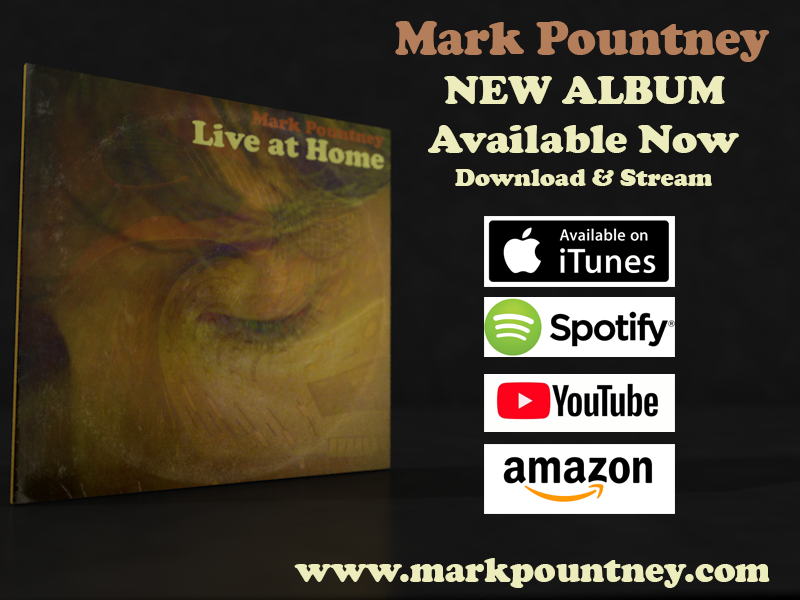 In the meantime, I have released a selection of solo acoustic recordings on a new album called Live at Home. The songs were recorded live on Boxing Day 2017. Since the last two albums involved me playing the additional instrumentation, I felt it was time to do something a little lighter on instrumentation. I was also intrigued to learn how Springsteen went about recording his 1982 classic, Nebraska, and the simplicity of that setup. The Boss used a Tascam PortaStudio and a pair of Shure SM57s (not even 58s!!?). So, I wanted my next album to be really stripped down, with the songs performed in their rawest form, just guitar and vocal. I’ve owned a Tascam 414 mkII for a number of years and haven’t put it to much use, but on this occasion, as well as recording to my usual DAW, I also ran a feed to the tape machine. I’ve shared both versions on this album; digital and the analog mix. Eight of the songs were recorded live using a simple setup of RODE NT3 on the acoustic guitar and an RODE NT1 for the vocal. I used two guitars on the session a Guild and a Larrivee. Two more songs were added to the list; Don’t Let Me Go and a slow version of Simple Story; a song I had recorded and perfumed with the Mojave Collective and which features on the album Rust’n’Dust. This recording included some over dubbing of background vocals and a guitar solo. The song list is made up of, what I feel are, some of my best songs. Most of these I perform live regularly, others have never been performed live before. Footprints in the Sand is a gentle folk song; poetry set to finger-picked guitar. A gentle start to the collection. I’d had the melody for a few years before I finally got some words to settle with it. I’m happy about the way it turned out. I can imagine doing a version with Simon & Garfunkel style harmonies on the vocal. Here’s alternative version recorded in the car. Won’t let you down is sort of an outlaw ballad. It suggests the build up to a police raid on an ex-con who is innocent and has tried to put that life behind him. I didn’t plan the narrative while I was writing the song, it just evolved. There’s a human element introduced with mention of getting his kids to safety. There’s a lot in there and I was lucky to have stumbled on a melody that would allow for that. Stonewalled is a story of someone travelling to on an adventure overseas; an encounter, horizons opening; where there once were blocks. The chorus is right at the top of my natural range it’s a good one to get down while I can still hit it in the original key. She’s got a plan is a comedic tale of a guy who ends up spending time with a female secret agent. Initially he thinks she’s trying to kill him but she ends up saving him..or does she? Again, I don’t start out with these ideas and write them, they evolve with the rhymes and the melody until I settle on something that feels right to me. Going Home. This song was influenced by James Taylor. I wrote this in a motel in Plano, Texas. Originally, it had a different picking pattern and it wasn’t a song I’ve spent a lot of time playing. Over time the picking developed. The linking guitar part before the second verse was worked out a few moments before I began to record. Lyrically I just pulled imagery from the room together and combined them with things I was feeling at the time. There’s a contradiction due to the perpetual need to be moving on and the desire to go “home”. Home Coming has little to do with the previous song, except in title. They were written a couple of years apart. It’s a quirky tune with kind of a ragtime feel. I’d like to record this with rolling piano and brass someday, but, at the moment, this is the only way I can get it down. The Mission, well I guess this was influenced by Elton John’s Rocket Man and They Punctured the Yolk by the Flaming Lips. It’s a tale about someone getting sent on a space mission, away from his family. Maybe someone who’s died and has left the earth; a dream perhaps. I’m planning a bigger production version of this in future. I think it still sits well as an acoustic track. Don’t let me go is influenced by artists such as Otis Redding, Eddie Hinton and Delaney Bramlett. It’s the only soul song on the album. I enjoy singing in a different style. It’s always worked well live. I remember performing this during a support of James Burton. James stood at the side of the stage near the back and, when I finished, he said he really enjoyed it and could imagine getting a recording done with Steve Cropper, Glen D Hardin and a few other guys on it, he was pretty excited about hearing it. I was just pleased that he stayed and listened! Simple Story was originally a live favourite when I was in the Mojave Collective. As I said earlier, an upbeat version is available on the Rust & Dust album. The original features some great musicianship from the band, particularly Tommy Clarke’s guitar. The new album version is a completely different take on the song; much slower with picked guitar. I used a couple of overdubs on this for vocals and a guitar solo. There’s a lyric about “Blood and Snot” and I have to give a nod to my Grandad here. When he used to talk about the fist-fights they used to have when he was in the Merchant Navy, he used to laughingly describe decorating the walls with blood and snot. I Know is the last track on the album. A fairly abstract lyric with a south of the border feel in the chords. This is another that I’d like to give a full band treatment to in future. The new album will be available on iTunes, Spotify, Amazon and all major digital music stores. The last two-and-a-half weeks had been spent on the road; kicking off from LA and gliding up the meandering Pacific Coast Highway to San Francisco, then on to Yosemite, Bakersfield, Las Vegas, Monument Valley and back through to Joshua Tree. As soon as I arrived I was on the lookout for a guitar; something cheap I could put a pickup in and amplify. 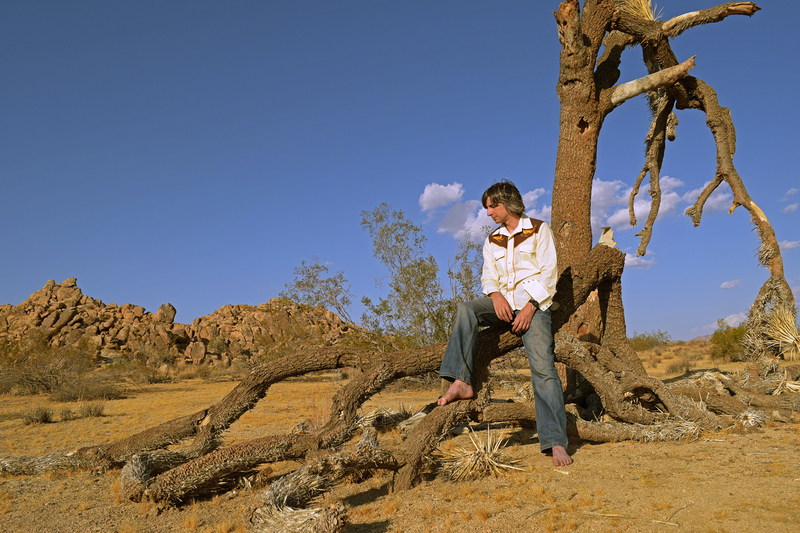 I had a couple of shows teed up before I arrived; The International Pop Overthrow Festival and …..I also knew that there was an open mic in Joshua Tree at the end of our trip. We picked up the campervan (from Escape Campervans) and drove down Sunset Boulevard; LA was a pretty stressful place to get used to driving a big vehicle on the left. I checked out Sam Ash and then on to Guitar Centre. We spent a good thirty minutes in the doorway just looking at the handprints of so many music legends, including James Burton; whom I had just supported a few weeks earlier. I knew pretty much what I was looking for, so although I could have spent all afternoon looking at and playing on the jaw-dropping array of guitars, I located the cheapest guitar in the shop. I was pleasantly surprised when I picked it up for a strum. The price was just over fifty bucks. It was a Rogue RA-090 Dreadnought Acoustic Guitar and it played and sounded great! The frets were a little round and seemed to scratch against the strings. It would need some ‘playing-in’ before you could noodle further up the neck but, for open chords, it was perfect. We paid our respects to Merle Haggard, who had just passed away in April 2016. I played a version of Sing Me Back Home outside his childhood, boxcar home , which had just been installed at the Kern County Museum. 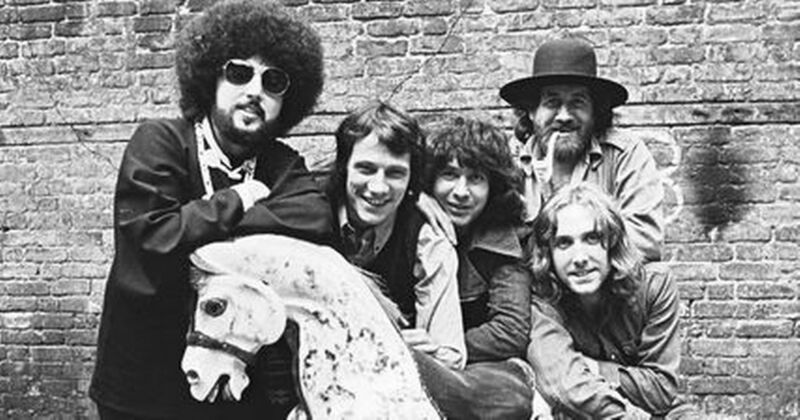 One of my favorite versions of the song is by Gram with the Flying Burrito Brothers. Sneaky Pete’s pedal steel solo on it is amazing. A shout out to Elmer Long who kindly let us shoot some video at his amazing Bottle Tree Ranch. An interesting guy who has no interest in technology whatsoever and lives a simple life. Californian-based photographer and travel enthusiast, Josh, has done a nice feature on the ranch check it out here. While we were in Bakersfield, we also dropped into Trouts; an iconic honky-tonk in Oildale, where Merle Haggard used to perform. When we pulled up the parking lot was more or less empty, yet, when we stepped inside, a band was playing and a few old-timers waltzed around the floor. The atmosphere was warm and welcoming. We talked with the bar manager and some of the musicians who were all very friendly. Before long, I was invited up on the stage to sing with the band. We did Sing Me Back Home. One of the musicians was local legend Pat (Banny) Bannister. I recently heard that Trouts is now for sale, but the famous sign, and the original owner, have disappeared. Later on the trip, we took the guitar to meet, what John Wayne affectionately referred to as “the Teapot, Coffee pot and the Sugar Bowl”, Monument Valley. The last stop before heading back was Joshua Tree. As part of my Birthday treat we were booked into the Gram Parsons legendary Room 8 in the Joshua Tree Inn. I wasn’t sure how we’d feel about being in the room where Gram Parsons spent his final hours, but it was quite an amazing experience, very homely, spiritual, difficult to describe. We spent a long while singing Gram Parsons songs and soaking up the peaceful vibe that was everywhere. The day before we’d been back to the Guitar Centre to see how much it would cost to ship the guitar back home to the UK. The guy at the desk looked puzzled and laughingly told us that it would cost much more than the guitar was worth. So on the final day, I decided to leave the guitar at Cap Rock for someone to find along with a Mark One CD. For anyone who doesn’t know, the story goes that Gram made a pact with his road manager, Phil Kaufman, whoever died first, the survior woul take the other’s body to Joshua Tree and burn it out in the desert. Well, Gram went first and Phil honored the promise. He borrowed a hearse, intercepted the body at the airport, stole it and set fire to the body near Cap Rock. There’s plenty of articles on this and one film, starring Johnny Knoxville, called [amazon_textlink asin=’B0002ZO73E’ text=’Grand Theft Parsons‘ template=’ProductLink’ store=’wwwmarkpountn-21′ marketplace=’UK’ link_id=’be142a5a-0a64-11e8-bef2-35251c8374fe’] . I left a note inside the guitar with email/web address. As yet no one has been in touch. Maybe Gram decided to keep it for a while.